Your home will always be comfortable with propane! 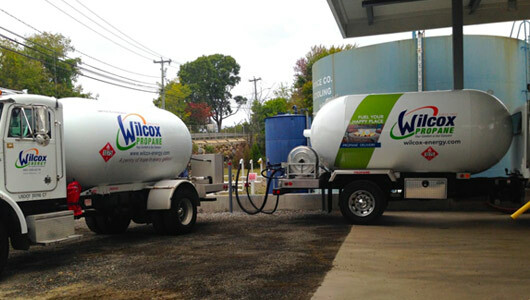 We make the process extremely easy to switch to Wilcox Energy for all of your propane delivery needs. Rest assured that your propane will be delivered on time, all the time with Wilcox! We always have our own supply. In the unlikely event of a supply interruption, you’ll continue to be fueled. Delivery is always prompt and economical because we’re right nearby. We’ll contact your current provider to inform them of your switch. We’ll arrange for a new tank delivery to your home. We’ll disconnect your old tank, install the new one, inspect it and perform a leak test. Are you an oil customer on automatic delivery with Wilcox Energy? Enjoy a $.25/gallon discount on the cost of propane. Never Run Out of Propane Again! With our cellular tank monitoring service, we will monitor your tank from our office, delivering right when you need it. Guaranteed. This service is perfect for unpredictable usage including pool heaters, fireplaces, and generators. Switching to Wilcox is as easy as 1-2-3, so if you’re looking for a reliable propane provider, then experience the Wilcox difference today!